Lehman College has adopted seven institutional learning goals or - institutional learning outcomes (ILOs) . Collectively known as Characteristics of a Lehman Graduate, these ILOs represent the knowledge, skills, abilities, and habits of mind expected of all students by the conclusion of their undergraduate studies at the College. To ensure that students are meeting these expected outcomes, the College engages in periodic systematic assessments of the ILOs. The following tabs describe the methods that have been employed over the last several years along with results from these assessments. Written communication is defined as the development and expression of ideas in writing. It involves learning to work in many genres and styles and can involve working with many different writing technologies, and mixing texts, data, and images. Written communication abilities develop through iterative experiences across the curriculum (AAC&U). Lehman College has a long history of promoting writing throughout the curriculum. Written communication is embodied in the College's seven Institutional Learning Goals - Demonstrate outstanding communication skills in diverse media: "Students effectively communicate with diverse audiences in diverse settings and through diverse media as well as use appropriate rhetorical strategies with different audiences." Students starting their academic careers are Lehman are expected to complete four course sections designated as "W - Writing-Intensive." At least one "W" section must be completed after the student has completed 60 credits. "W" sections, at all course levels, create class environments that provide students with opportunities to use writing as an essential tool for learning course material and for engaging in the academic and professional discipline specific conversations. - writing can be used to promote critical thinking and learning. WAC strategies help students understand course content while expanding notions of themselves as thinkers and writers. The WAC program has numerous resources available to assist faculty. Please refer to the WAC website for more information. Lehman College is committed to providing students with an education that will prepare them to be successful in their professional lives. Strong written communication skills are essential, regardless of the that that graduates take after leaving Lehman. In fact, the ability to write well is among the most highly coveted attributes sought by employers. According to the National Association of Colleges and Employers, more than 80% of employers look for evidence of this skill on students' resumes. To assess writing reliably, the use of a scoring tool is highly recommended. Lehman has agreed to use the AAC&U Value rubric to assess written communication in many courses. This rubric breaks down the goal Understanding Communication in Diverse Media (i.e., written communication) into measurable criteria and allocates benchmarks to measure levels of proficiency. This rubric also helps to facilitate scoring student artifacts consistently and objectively. To be clear, faculty are free to grade student papers to derive an overall course grade; this can be done based on criteria established by the instructors. However, to provide reliable and valid results, a reliable scoring tool is necessary. 2) grade student work using the rubric. The following links also contain additional information about assessing students' written communication skills. Lehman College has a long history of developing student's quantitative reasoning skills. In 2010, with the help of a CUNY grant to assess and improve quantitative literacy, the College established a Quantitative Literacy Initiative to assess the current state of student learning with regard to this core fluency and to suggest ways to improve the teaching of quantitative reasoning. In 2016, Quantitative Reasoning was adopted as part of Lehman College's third institutional learning goal - Demonstrate skills in quantitative reasoning, information literacy, and research: Students capably comprehend, analyze, interpret and present quantitative data. And in 2018, Professor Esther Wider was awarded a $1.5 million National Science Foundation (NSF) grant to improve the ability of STEM faculty to teach quantitative reasoning skills to undergraduate students. Lehman's Quantitative Literacy program is committed to infusing numerical literacy across the curriculum. The program maintains a website with numerous resources available to assist faculty for developing QR literacy in their classrooms. For additional information, please contact Lehman's QR coordinators, Naomi Spence and Mia Budescu. Quantitative reasoning is not the exclusive domain of math and the sciences. QR can applied more broadly and can be applied and assessed in almost every discipline at the College. According to AAC&U, teaching QR requires instructors us to design assignments that address authentic, data-based problems. Such assignments may call for the traditional written paper, but we can imagine other alternatives: a video of a PowerPoint presentation, perhaps, or a well-designed series of web pages. In any case, a successful demonstration of QR will place the mathematical work in the context of a full and robust discussion of the underlying issues addressed by the assignment. Information Literacy is the ability to know when there is a need for information, to be able to identify, locate, evaluate, and effectively and responsibly use and share that information for the problem at hand - adopted from the National Forum on Information Literacy. - Understand the economic, legal, and social issues surrounding the use of information, and access and use information ethically and legally. Lehman College has identified Information Literacy skills as one of its seven institutional learning goals, meaning all Lehman students are expected to become information literate individuals by the time they finish their studies. 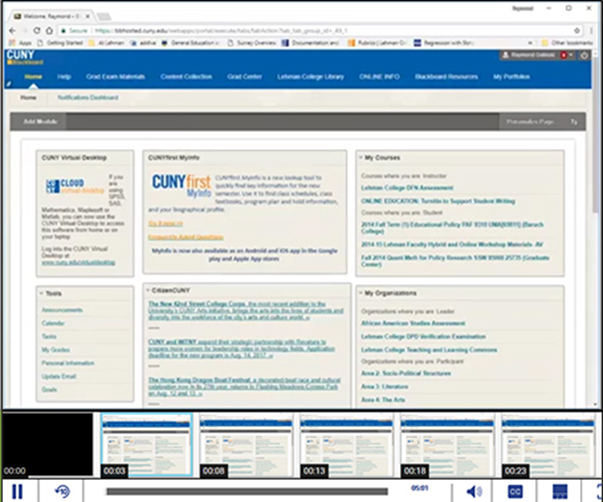 To help students become better information consumers and "users", the Lehman College Library has developed series of four online modules to assist students. To assess students information literacy skills, faculty do not have to score student work with a rubric. Instead, instructors should inform students of the importance of information literacy skills and provided them with step-by-step instructions on how to access the tutorial. The tutorial consists of the four videos and a 20-item quiz. Upon successful completion of the tutorial, students can receive a certificate -- a digital badge -- that can share with future employers and posted to social media profiles. At your discretion, you may also elect to provide extra credit for completing the tutorial. Students can email or print their badge as evidence of completion. (Note. students will be accessing the tutorial in a separate Blackboard course, not your own). In order to access the information literacy modules, students must enroll in the Information Literacy course in Blackboard that has been established for this purpose. Step-by-step directions on how to enroll in the course are provided on the following page - http://www.lehman.edu/academics/literacy-course-enrollment.php. The directions describe the steps that must be taken to access the modules, take the quiz and to claim you digital bade. They are also provided in the Blackboard course. 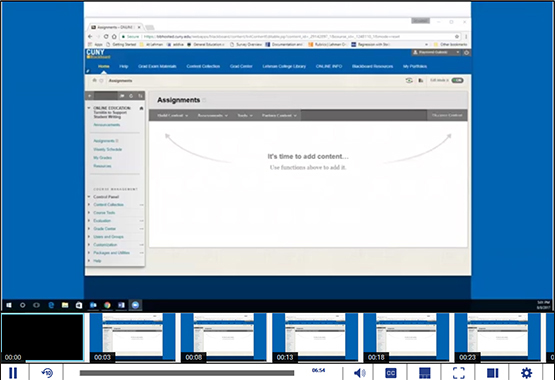 Once enrolled in the tutorial, students should view each of the four modules in succession and answer the questions as they move along. Each module takes about 15 minutes to complete. At the conclusion of the fourth module, there is an 20-item quiz to test your knowledge on the information you have just viewed. Click on Take the Quiz. Save your answers to each question as you proceed. Click Save and Submit when finished. You may take the quiz up to two times. Once you have successfully taken the test, please follow these instructions to claim your Information Literacy Badge. Go to https://lehman.credly.com/sign-in to create an account, if you do not have one yet or sign in. Once you are logged in, click on Claim in the top right corner and enter the Claim Code. You will see the Claim Code in STEP 3: Claim Code once you have completed Step 2: Take a Quiz Your badge is portable and includes the details of your accomplishment. When you choose to make your badge visible to others, they can see what it took for you to earn your achievement. You can easily share your badge on social and professional sites. You can also send a link to it by email, add it in an e-mail signature, blog or website. Instructions for sharing your badge are here. Lehman is proud of your accomplishments and we hope you will maximize the benefits of your achievement by sharing your success with others. Enjoy putting your credential to work.